Some chickens died in a semi-truck accident that shut down a portion of Interstate 5 near Olympia early Monday morning, but others bolted and — if they’re anything like their predecessors loosed in a similar accident years ago —they could find a new free-range life. The crash happened around 4 a.m. when the driver of a northbound semi-truck lost control and struck the center jersey barrier, according to Washington State Patrol spokeswoman Trooper Johnna Batiste. The semi was fully loaded with hundreds of chickens when it crashed near the intersection of Highway 101, she said. No other vehicles were involved, and there were no injuries reported, she said. 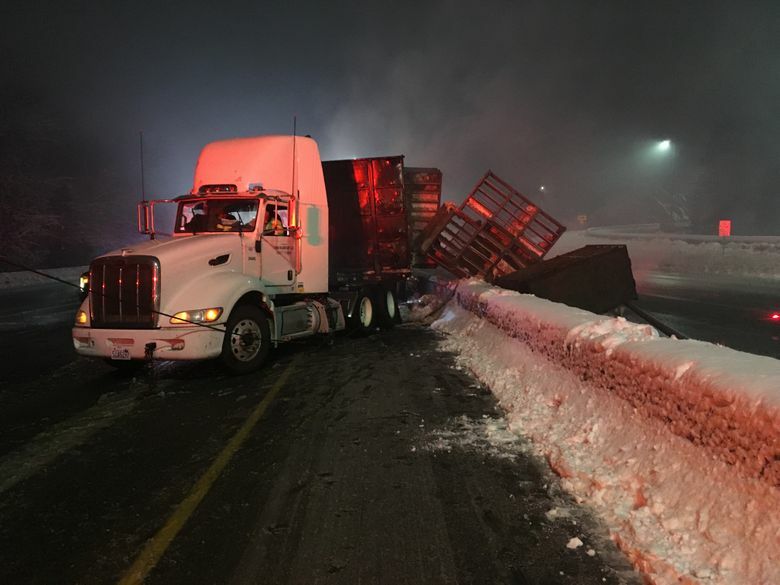 However, several lanes in both directions remained blocked at around 6 a.m. as crews moved to pull the semi off the road and replace the damaged jersey barriers, according to the State Patrol. Batiste said in an updated post shortly before 11 a.m. that many of the chickens had been rounded up by state troopers and taken to live on a nearby farm. But for those that might have managed to escape police as well, there’s still hope. Batiste said her father, John Batiste, the chief of the State Patrol, tells a story, she said, of a similar accident on I-5 near the South 56th Street exit in Tacoma years ago.